Earth-approaching asteroid 2014 RC ripped pass Earth today, got its orbit refashioned by our planet’s gravity and now bids us adieu. I thought you’d like to see how fast this ~60-foot-wide (20-meter) space rock moved across the sky. The team of observers at Remanzacco Observatory in Italy photographed it remotely with a telescope set up in Australia. 30 minutes before closest approach to Earth of 25,000 miles (40,000 km), 2014 RC was traveling at the rate of 49.5 arc minutes (1.6 times the diameter of the full moon) per minute. 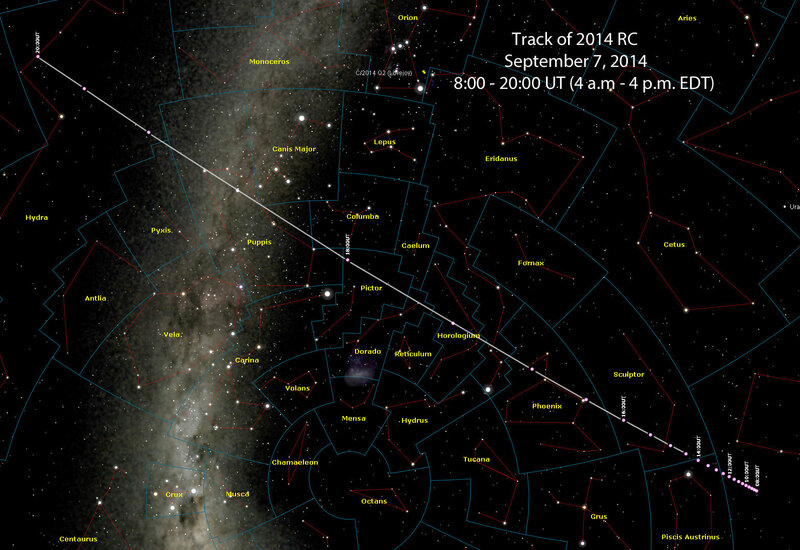 2014 RC accelerates across the sky from 4 a.m. to 4 p.m EDT in this path created by Gianluca Masi using SkyX Pro software and the latest positions from JPL. he asteroid’s intrinsic speed was not exceptional, but because it came so close to Earth, it covered a huge swath of sky in a hurry. At the time, the asteroid glowed at magnitude +11.2, bright enough to see in a 4.5 inch telescope even in the bright moonlit sky at the time. Let’s try to get a feel for its speed. Just to keep 2014 RC centered in the field of view, you’d have to continually move the telescope to follow it as it you were tracking an airplane or satellite. What a thrill it must have been for observers in Australia and New Zealand who got the ride of their life across the heavens hanging onto this fleet rock with their eyeballs. In an hour’s time, centered on closest approach, the asteroid traveled approximately 48º. That more than twice the length of the constellation Orion! As 2014 RC blew by, its orbit was bent by Earth’s gravity and sent on a new trajectory. If this sounds familiar, we deliberately performed the same maneuver with the Voyager I and II spacecraft back in the late 1970s and early 1980s. A rare planetary alignment allowed scientists to swing the probes near Jupiter and Saturn to gain speed and shape their orbits for future encounters. Such gravity assist maneuvers are now commonplace. No doubt 2014 RC will approach Earth again, but no threatening encounters are in the cards for at least 100 years. For now we’re grateful it passed safely while inspiring wonder at what the solar system can throw at us. Update: here’s an additional set of images from Peter Lake from Australia. You can see more on his blog here. Three 30 second exposures at different times during Asteroid 2014 RC’s pass by Earth on September 7, 2014. Credit and copyright: Peter Lake. thank you for the prompt reporting Bob. Couldn’t help thinking about an episode of “Lost In Space” when the Jupiter 2 spacecraft was within sight of Earth only to be in a trajectory taking it faaaar away. Oh the pain, the pain of it all! Also the Nicaraguans think they might have a sizable piece of 2014 RC. I’ve seen the photos, too. Definitely not caused by 2014 RC even if they’d like to think so. I doubt very much that this is a crater caused by a meteorite. No reports of any meteors beforehand, and the area is heavily populated. The first use of gravitational assist (“slingshot”) maneuvers was not Voyager 1 nor Voyager 2. Mariner 10 used the gravity of Venus to direct it to Mercury in early 1974, and Pioneer 11 used an assist from Jupiter in late 1974 to shape its trajectory toward Saturn, which it encountered in 1979. Voyagers 1 and 2 reached Jupiter in 1979 and Saturn in 1980 (Voyager 1) and 1981 (Voyager 2). You’re correct and thank you for pointing this out. I have corrected the error. Er, If memory serves, you have mentioned Australia in both of your stories regarding his asteroid. Perhaps you did not see it to be of any importance that its closest approach was over NEW ZEALAND! Perhaps you might be thinking we are a part of Aussie. No we are not! I just picked Australia to represent the largest southern hemisphere region where it would be visible. Didn’t mean to overlook you. My apologies. This page tells me there are 4 comments below but I can’t see any of them, so apologies if I am duplicating something. Is the speed of this asteroid really so amazing? It appeared to move 1.6 times the moon’s diameter in a minute. But it’s ten times closer than the moon, so it’s actual speed is only 0.16 times the moon’s diameter per minute. The moon is about 2000 miles in diameter, so the asteroid is moving about 300 miles per minute or 18000 miles per hour. That’s about the same speed that the ISS moves. And the ISS moves much faster in terms of arc minutes per minute. The asteroid’s closest approach was just about the same distance from earth as geosynchronous orbit. Sure it’s moving faster than our satellites at that orbit are moving. But that’s why it moved back out into space instead of staying in orbit around earth. The earth’s speed around the sun is move than 1000 miles per minute. So this asteroid is moving just a little bit faster than the earth. Thanks for your comment and additional information on 2012 RC’s speed. The amazing aspect was not so much the asteroid’s intrinsic speed but how rapidly it covered the sky because of how close it was to Earth. That was the point of the article. I don’t know why but I can’t see the existing 9 comments. So perhaps someone else has already posted this. I wanted to know the speed of this asteroid. Haven’t done a trig calculation in decades and thought it would be fun to try. I think we can approximate with an isoceles triangle with an apex angle of 49.5 arc minutes and with the equal sides of 40,000 km each. (The asteroid’s path is at the base of the triangle; it may well be slightly curved but I will assume it is a straight line. I get 572 km/minute, or 34,325 km/hour.